These decorative clips are beautiful accessories for the home, create a spring vibe all year round with this nature inspired clip. 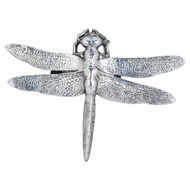 The intricate detailing and silver finish of this dragonfly clip makes this piece timeless and classic. A pretty little furnishing to add as a finishing touch.